I bet you thought I would say “Salesman” – it was tempting… but I won’t mislead you there! 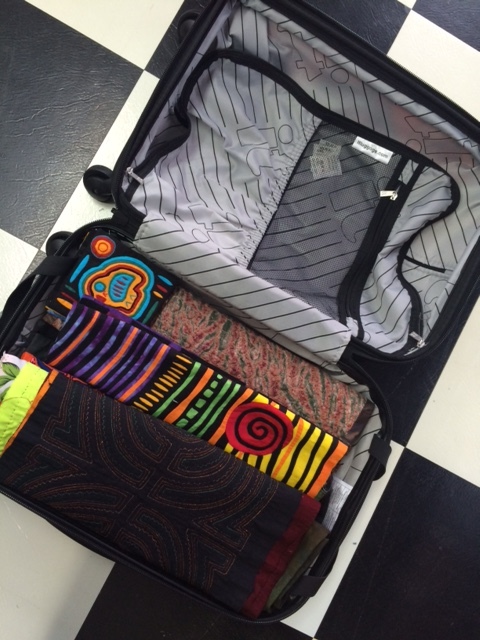 It’s that time again: I am packing for yet another teaching trip. 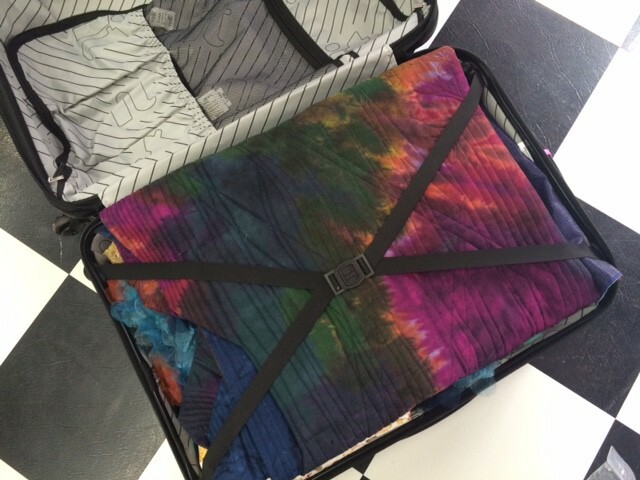 Packing continues to pose challenges for me especially when I have to bring along quilts for a special exhibition or a trunkshow. 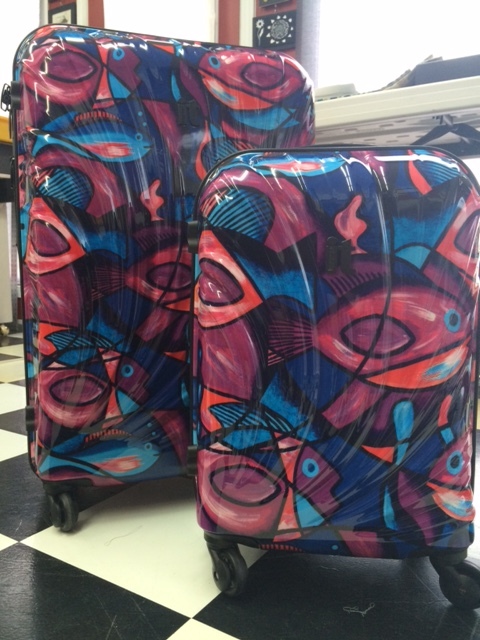 Throw into the mix some new luggage. 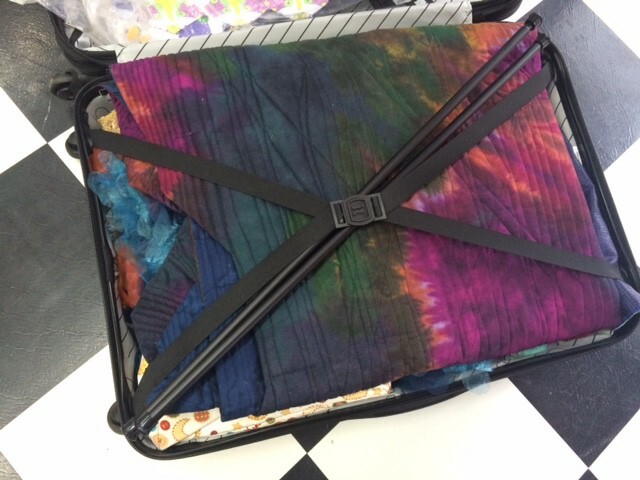 On my homeward bound trip from Quilting by the Lake a couple of weeks ago my hard sided carry-on case had to be left on the tarmack and placed into the cargo hold as the plane was a 20 seater…. not my favorite sized plane for obvious reasons. When I pulled my luggage off the cart in Toronto I was halfway into the building to clear customs when I noticed a huge dent and a corresponding crack through the hard-shell material. (Thanks Air Georgian operated by Air Canada!) I can’t recount how many times I have had to replace suitcases over the past 8 years of travel… I suppose it goes with the territory and needs to be calculated into the cost of doing business. My class samples I place into my carry on along with most of my clothes. I continue to worry that my larger case does not arrive at the destination airport at same time as I do. It has happened – usually on the way home which doesn’t pose much of an issue, except that we have to make another trip to the airport well over an hour away – we live in the country where the airlines don’t deliver lost luggage. This time I am leading workshops in Mola making (full with 25 participants! ), abstracting design, and embellishment at World Quilt in Manchester, NH. It will be so wonderful to return to this Quilt Festival organized my Mancuso. They are introducing a new format this year, a Three-Day Show Vacation package. The venue is great and right in the middle of town which enables everyone to explore the rich architecture, textile mill history and (do I dare say it) fabulous restaurants. I look forward to connecting with teachers I met over the last couple of years while teaching for Mancuso Show Management and can’t wait to meet some new faces along the way. Meanwhile, packing comes first… Let me refocus on the “important stuff.” When traveling to Quilting by the Lake I made the decision not to bring a “proper” camera. I used my iPhone, and while that works for candid classroom shots I was not able to capture some of the subject matter around campus to satisfaction. This time I am ensuring that I have my regular DSLR by my side. I used my mirrorless camera last year and was satisfied for the most part with the results. I am planning on better images of the New England area for 2015. 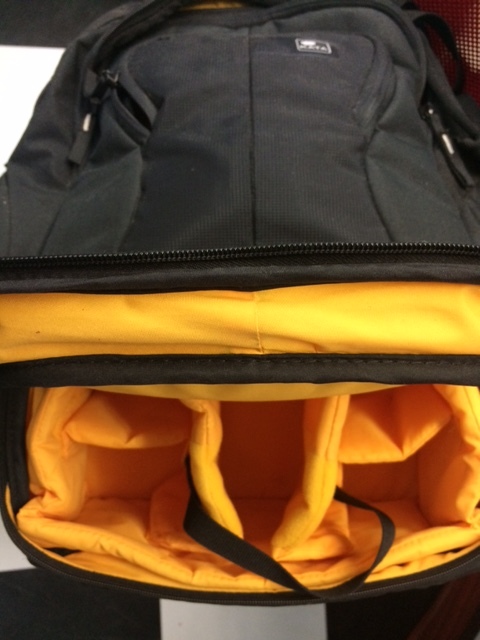 So, I am adding a smaller camera knapsack which will also hold my lap top and will take the place of a purse. 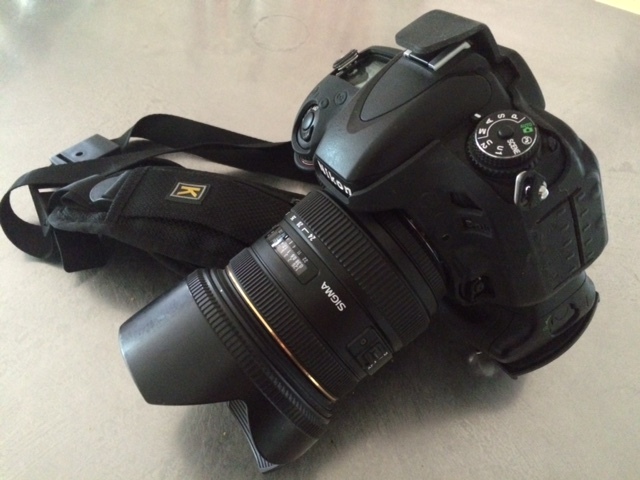 In goes the Nikon D610… stay tuned for images along the way! All I need now is great weather and the wonderful guides I had last year…. Check out my travel blog from 2014. 07 Aug	This entry was published on August 7, 2015 at 6:18 am. It’s filed under Art, Exhibition, Journaling, Quilt Show, Special Project, staying in touch, Travel, Workshop Opportunity and tagged bringing my camera, Mancuso Show Management, my attempt at humour, new luggage, packing for a special exhibition, packing for a trunk show, packing for another trip, packing for my next trip, packing for various workshops, packing priority - my full frame camera, Photography, travel, US East Coast trip, World Quilt - New England XIII. Bookmark the permalink. Follow any comments here with the RSS feed for this post. Anna, where do you get your telescoping hanging rods? It sounds like a brilliant idea. Safe travels and enjoy your trip! Packing is always so difficult. We tend to take too much stuff (just in case!). The fabric has me giddy. What bright and bold colours. I did a mola a few years ago and soon realized that my fabric choice while okay, should have been turned up a few notches. Enjoy the east coast. Sunshine hasn’t been too plentiful. Glad I added some color to your day, Katina! 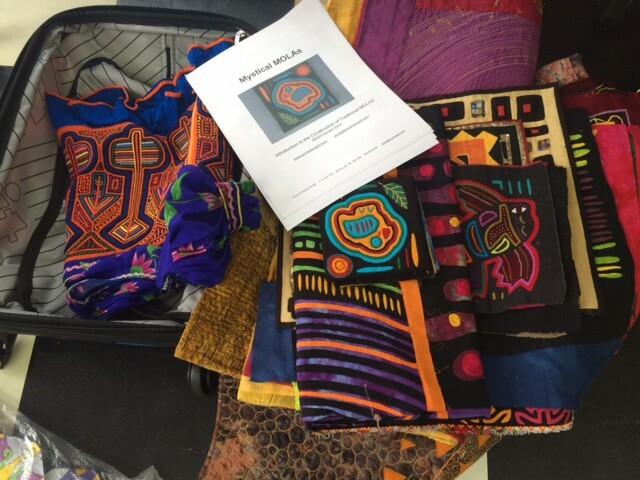 Molas and color go hand in hand! Thanks for the tip for packing. Last year it was hot and only rained while I was judging. Here is to hoping that I can push those clouds out of the way from the air planes. Have a great weekend.